This is for US App Store reviewer frankster222 who gave us one of our only seven 1 star reviews stating “Fun little game. Level 34 is impossible. Deleted”. Comparatively, we have two-hundred and seventy 5 star reviews in the US app store. I think this is a good ratio. 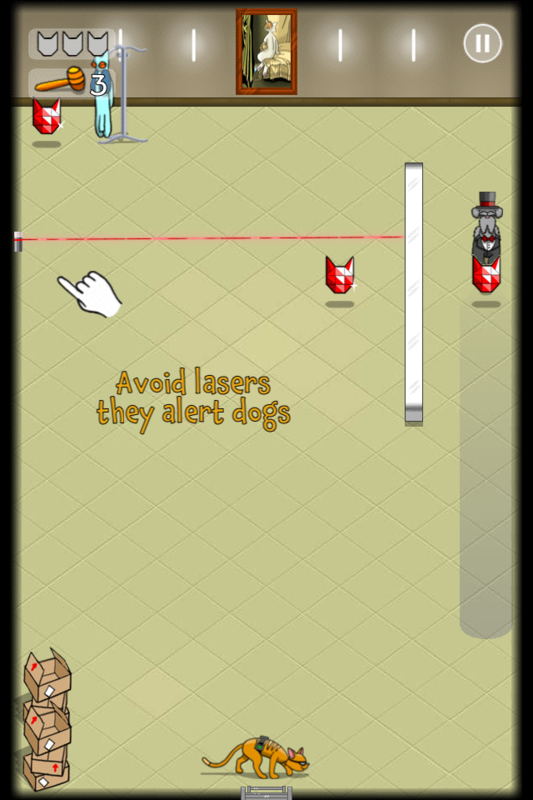 This level is designed to teach you about lasers. 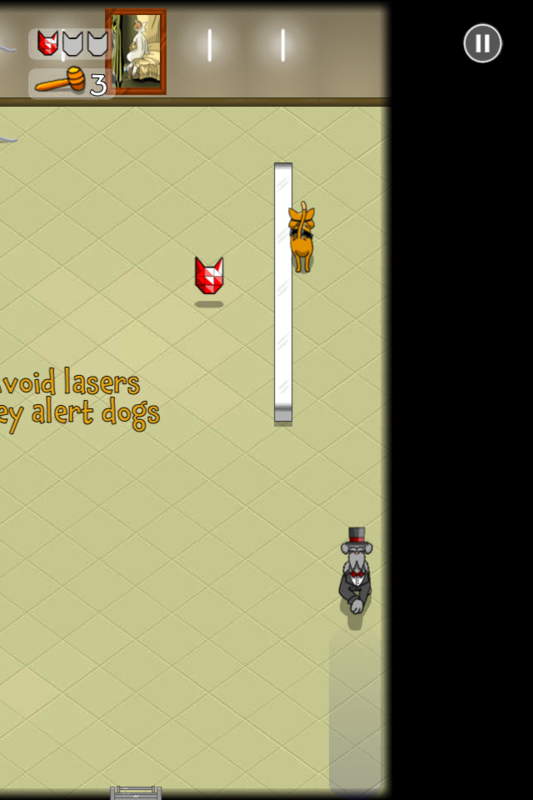 The laser heads from top to bottom of the white wall then disappears for a few second. For now, do like the tutorial says and avoid it. Instead you should challenge the dog. If you head to the white wall right away, the dog will eventually pass you. Once he has it’s safe to get the gem on the right. There will be 5 or 6 seconds before he turns around again. 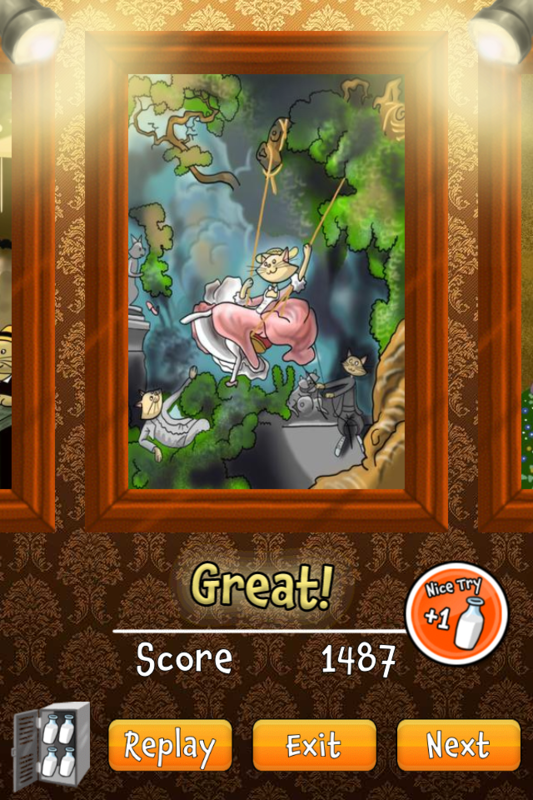 After you’ve gotten the gem, it’s time to get the painting at the top of the screen. Once you get the painting, the tutorial text changes. 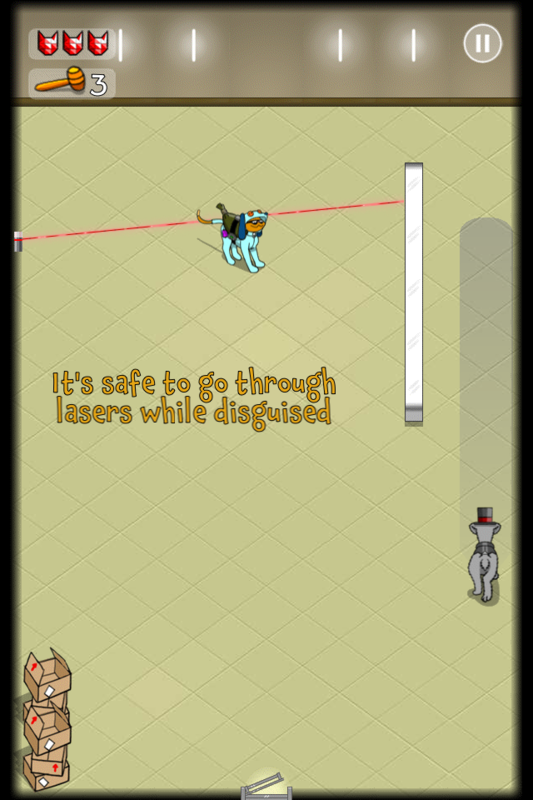 You can fool lasers just like you can fool the dogs with the disguise! Excellent right? There’s nothing between you, the disguise and gem. Go ahead and grab those now. 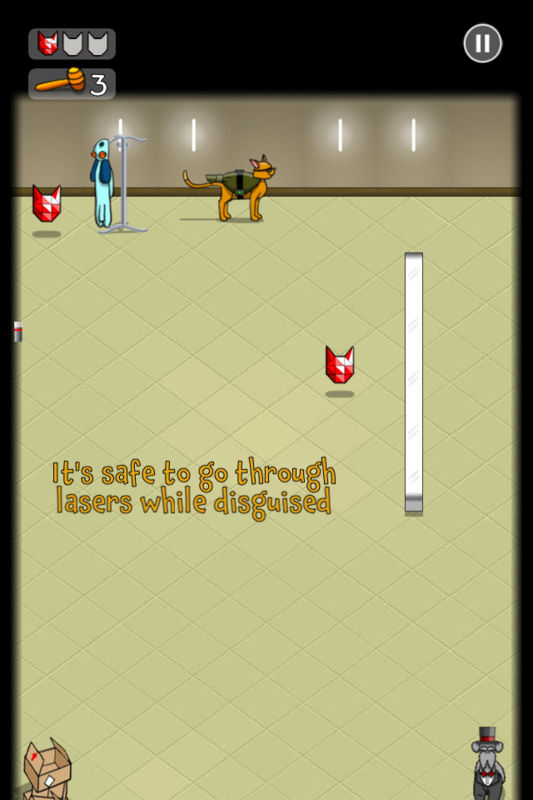 Hop through the laser with your disguise to grab the last gem. This is one of those levels where there’s no real reason to not grab all 3 gems. Without any power-ups (besides the basic cat speed 1) I’ve gotten a cool 1998 points using this method. There isn’t much advanced info I can give you, unless you have the gem magnet this level will always play the same. If you DO have the gem magnet, you can shave off 2-3 seconds automatically! The first gem comes to you when you’re walking passed the dog, the second gem comes to you when you pick up the disguise. The third gem comes to you once you’ve lined yourself up for the exit. 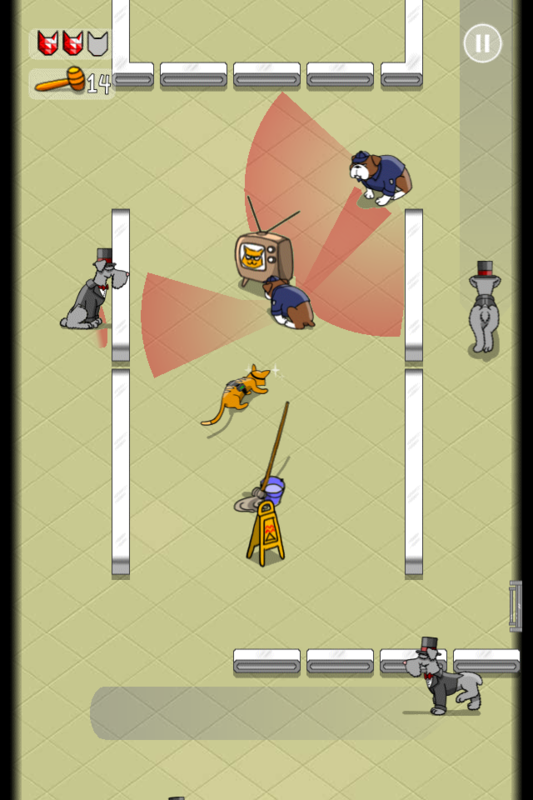 Using the magnet, cat speed 3 and arcade cat nets me a record breaking* 2316 points! *Better than any other Loopycubian. 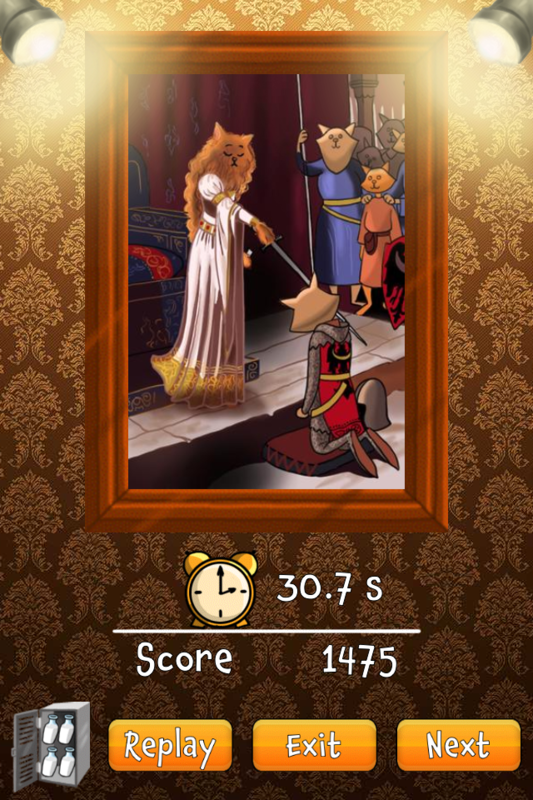 Seriously… beat this score and you’re better at the game than any one of us who made it. Doggenheim 10 is a toughy! What really makes it hard is the 2 criss-crossing bulldogs. 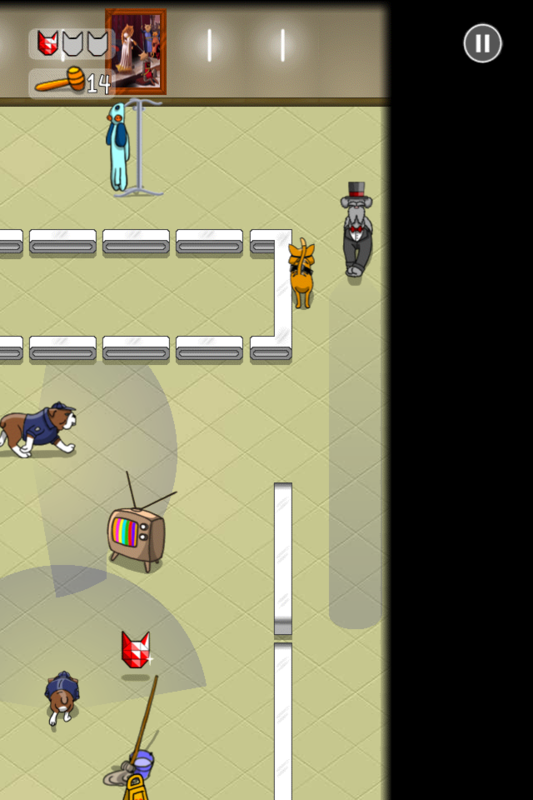 As soon as the level loads you’ll want to use the TV to distract the bulldog on the lower right. Go ahead, start tapping that spot now! This should let you swerve around the 2 schnauzers after they turn. Pause just a second, then race up and left to get around them, then straight for the disguise. By the way, your first play through you should probably ignore the gem on the bottom right otherwise you’ll have to be really quick to snag that and get the disguise before the bulldog is free from his television addiction. You can pre-emptively open the door at the top during that short pause you did or you can wait till you’re safely disguised like I have. 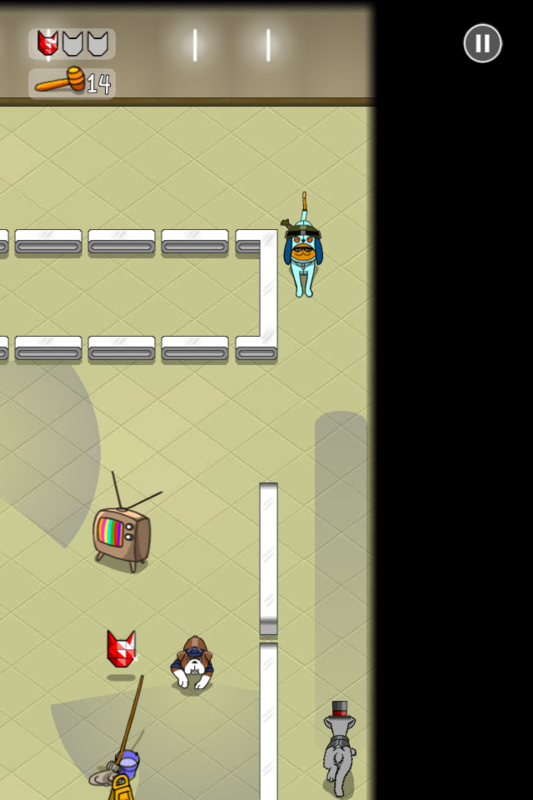 Grab the gem and painting and wait up against the top wall until the top bulldog is near a TV. As long as you haven’t waited too long, when the bulldog gets to the top right TV, the schnauzers should be safely away from the center of the screen. Use the top right TV and race down towards the exit! Here’s my score when I ignored the bottom right gem and used no power-ups. Getting that bottom right gem is a matter of being REALLY fast. It will take a few tries! Once you have the disguise and at least cat speed 1, and if you’re brave, it can last long enough to get you to the exit! Don’t wait, just RUN! Not waiting for the 2nd bulldog to reach the TV, using all my power-ups and grabbing the gem scores me a hot 2295 points. I’m sure I can get that up to 2300 with a few more tries or power-ups! 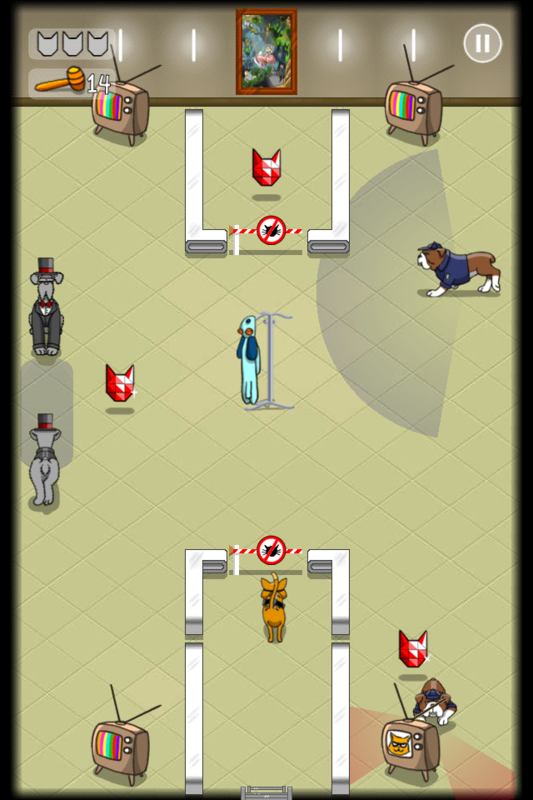 Doggenheim 6 at its base is a level that tests the player’s patience. It has 2 optional gems that can be tricky to get, so if you’re playing just to get through, you can ignore the 1st and 3rd gem you see. The first thing you should do is get to the right wall. You’ll need to move sort of quick, otherwise the dog approaching on the left will catch you. Move up to the third row. To my left is a gem. It can be tough to get, if you’re having difficulty with the level, ignore that gem. Wait until the schnauzer is out of your way and then zip past him. Here you see the gem that I skipped. 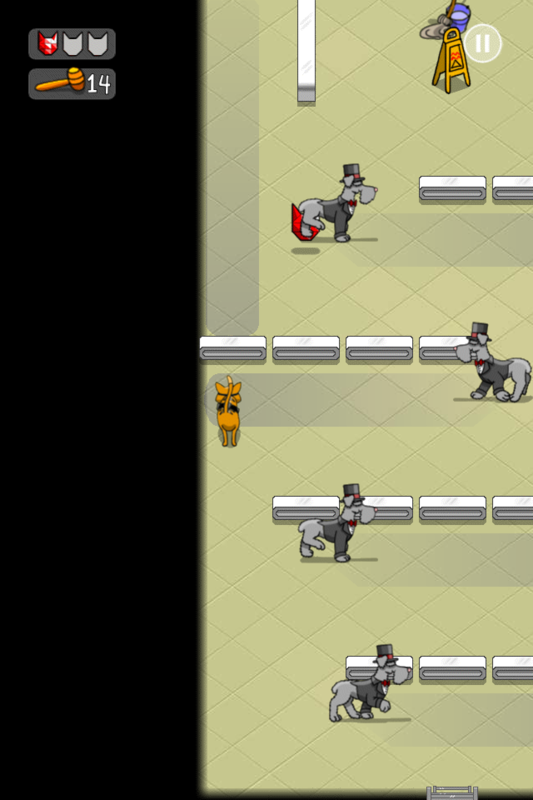 The 2nd gem was on the path to get to where Pickpawcket is standing now. If you’ve gotten to this point you’re doing very well. Only one more tricky part to get past. 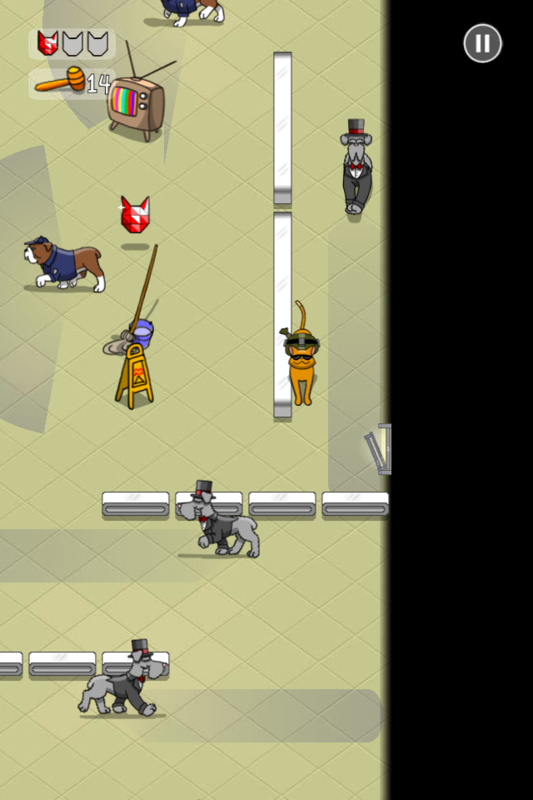 By the way, the gem guarded by the bulldog in this screen is rather tough to get – ignore it. Wait here until the top bulldog goes away. It won’t take long. Note: I’m right up against the wall. Schnauzers cannot see me here. Schnauzers are rather blind dogs. They can’t see you up against the wall. Stand here and wait for the schnauzer to get past you. Your target will be the disguise and painting when he passes you. You have plenty of time to get them at this point, but once you pick up the disguise move swiftly to make the best use of it. The cat is disguised and has the painting. Hence the giant smile on his face. Use the disguise to get past the bulldog. After that you’re home free. There is an exit on this wall! Don’t go back through the maze of dogs! Skipping the gems, using no power-ups (except cat speed 1) and taking your time will net you a pretty respectable score of 1400 – 1500. Grabbing the first gem of the level teaches an interesting maneuver. Even if the dog is staring directly at it you can grab it (just be sure to move away before the dog gets here or it’s game over!). 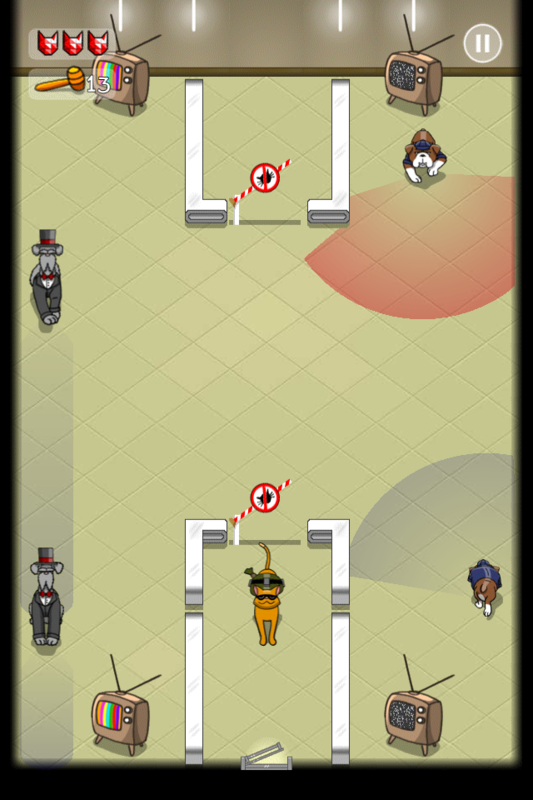 Position the cat just underneath the line of sight a few tiles to the right of the wall. Then walk directly to the wall. 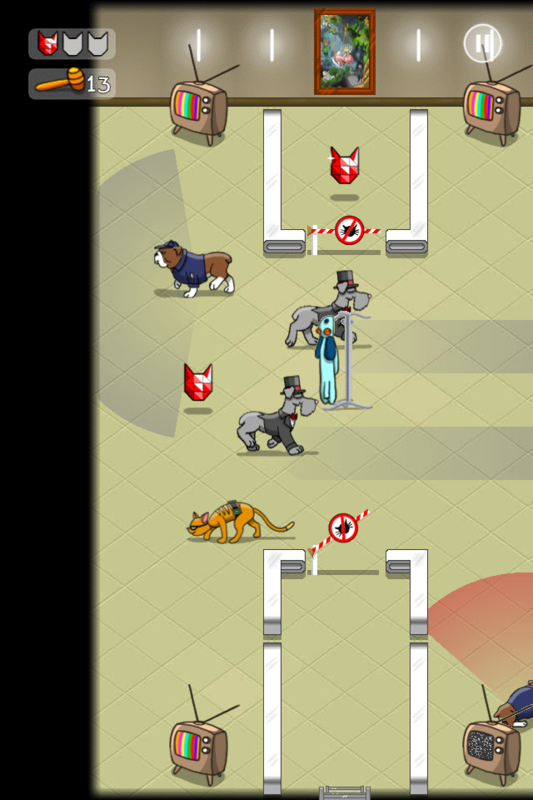 The cat will change directions when he touches the wall but will not be seen by the dogs! This will save you a whole second! The third gem involves using the television and then quickly moving up to grab it. I stand just under the yellow wet floor sign, tap the TV and then quickly zip around the mop to grab the gem. While it’s possible to do this without the “Cable Cat” power-ups, they certainly help! I haven’t touched this subject yet, but it’s an important one. What is “polish”? It’s the 20% of the game that takes 80% of the time. It’s the fine details that makes the app go from “Meh” to *Whistles*. Here at Loopycube it’s a gradual process that begins right after our prototype is complete and ends some months after we’ve released the game. 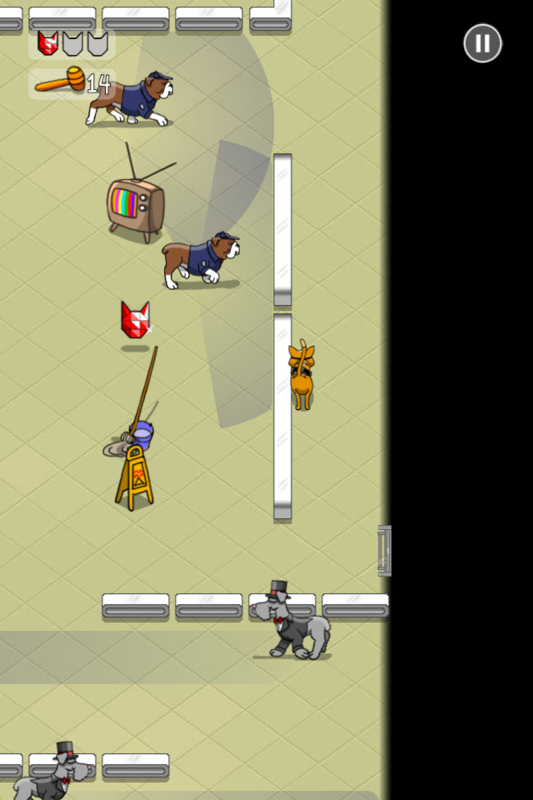 Just yesterday we were revisiting Pickpawcket’s icon, screenshots and a few screens in the game that we’d like to polish a bit more, even though Pickpawcket has been on the App Store for quite a few months already. This morning during a random visiting session we were talking about the early mock-ups of All In and how Matt (the art director of all people) couldn’t believe we actually liked them! Compared to what we have now, the mock-ups seem very dull and unfinished. 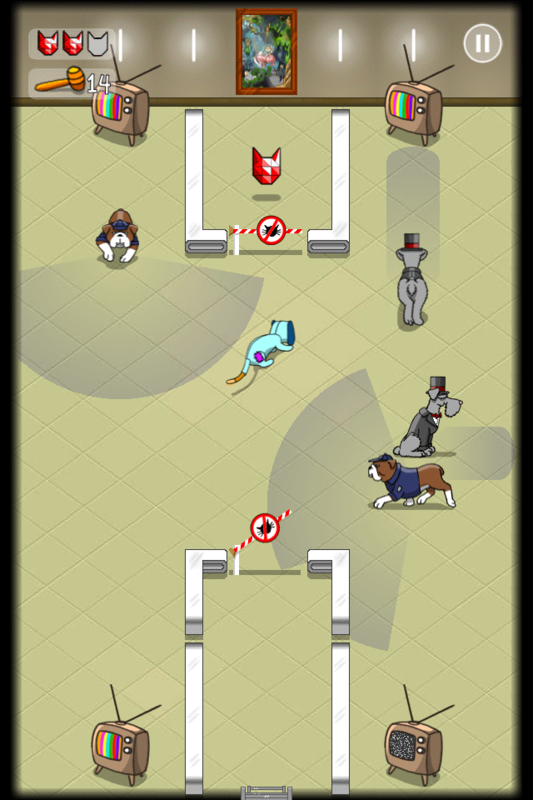 Every day we’re getting closer and closer to our perfectly polished game screen. However, all this polish comes at the cost of new sections being added to All In, so it’s really a delicate balancing act. It’s tough to know when to make that call, and tougher to convince the team to actually move on! Keep in mind, polish doesn’t only refer to art. Game play needs polishing as well! The perfect example occurred in All In this week; we had a penalty for not being fast enough. This added confusion, timing issues and was just a bad experience. So what did we do? Moved it to the front! Instead of paying for not answering, you paid for the privilege to answer, which added an infinite loop for players who were broke making them broke forever… and didn’t do anything to players who were obscenely wealthy. Finally, the simplest solution revealed itself: we will be claiming ‘play at your own pace’, so let’s actually let them play at their own pace. Penalty retracted! Do we start polishing too early? Do you do anything different? How do you convince perfectionist artists and game designers that their work is good enough for now? Also we’ve got the very first sharable image for All In. 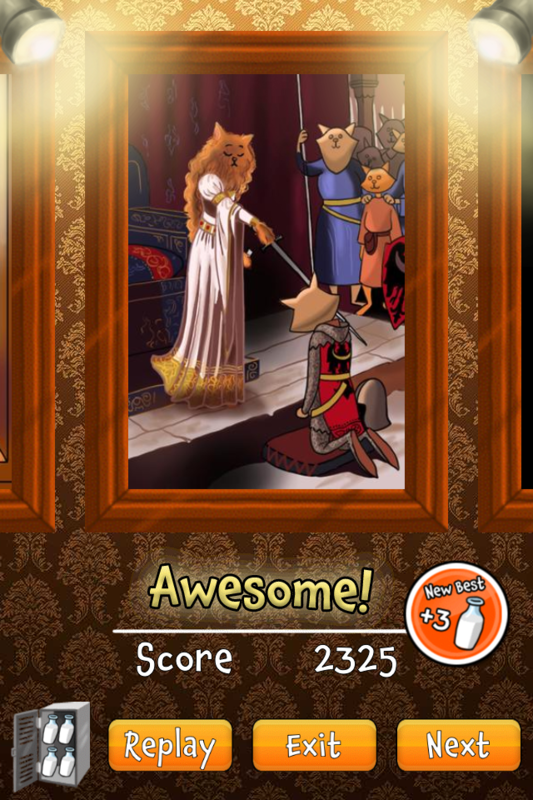 The rest of the screen isn’t finished (obviously considering today’s topic) but here’s a gold card. Gold cards give random rewards to player’s in game. Every time I see one in game I get excited, I can’t wait to see other player’s reactions! Click here to check it out… while you’re in the clicking mood, click the like button! Sharing: When and to whom? When you share your ideas depends completely on your audience. If you’re like me and have bosses, they want to know about the game they’re paying you to make pretty early. Fans of your company always want sneak peeks, so that means you want to give them updates as early as possible. And, of course, outsiders who you want to become fans of your game always want to feel in the loop; so again, earlier is better! How early is too early though? Dan and Odi (Loopycube’s producers) love to be in the loop, and they should be the first to know about the idea (besides myself of course). However I’ve ruined the chances for a handful of potentially great games by sharing too early. An idea needs to be at least somewhat out of the cloud and on paper before I can sit down with them and talk about it. I’ve now learnt that once I have a sketch and a few paragraphs about the gameplay I can open the door to my loopy mind for them. 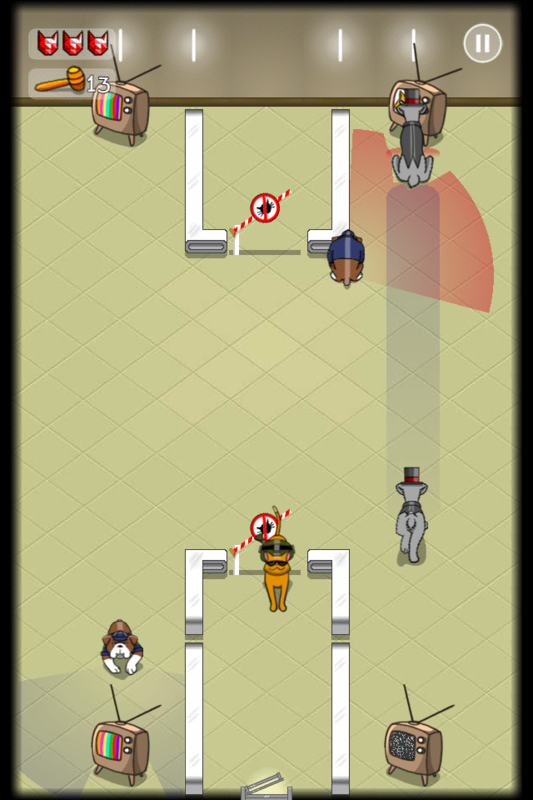 For our next game, I mulled over it (and a few other ideas) for a week before I took it to them. Sharing with our fans is a little harder to tell when the right time is. They tell me a resounding ‘RIGHT AWAY!’ However, fans are fickle. They can often get bored when you’re working with a 6 month development cycle (or more as Go Native!’s case was). They’ll begin to want something else that’s new and exciting before you’ve finished the game you’re sharing with them. I like to tease out information in the beginning. I’d never say ‘Gobblestoppers is our next game! It will be ___ and look like this’ with a bazillion screenshots. Then when we change our mind we’ve got some angry fans (especially if they liked that concept or that character). 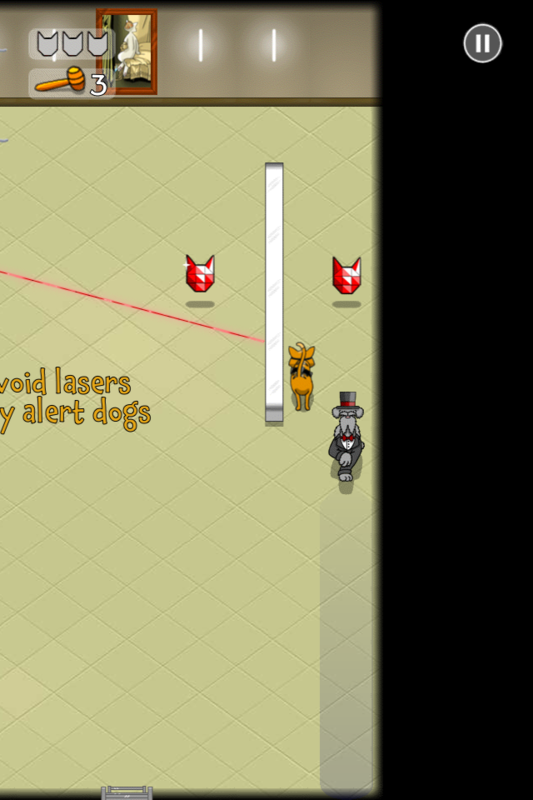 With Pickpawcket I shared a picture of 5 dogs and a cat and held a small contest to give it a story in February (about 5 months before we released the game). Simple, fun and let the fans know we love them. 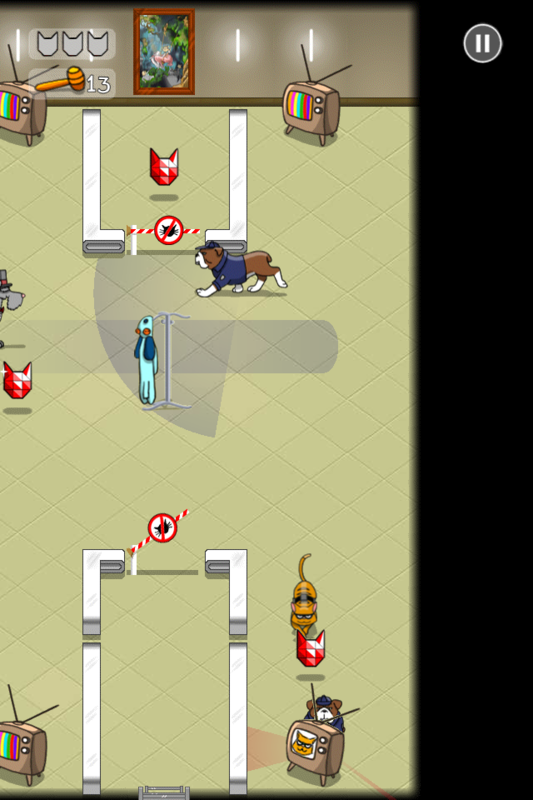 If you’re sharp you’ll notice we didn’t use that cat and one of the dogs when the game was released and no one made a fuss! What about outsiders? This is the trickiest part. I still don’t think we’ve got it worked out so we’re going to try something different. For Go Native! we started letting them know only a 2 weeks before we released. We were met with some excitement – but as a massively multiplayer game, we really needed to have much more hype at launch because an empty multiplayer game is dull! We tried slightly earlier Pickpawcket. It had better reception – twice as many hits and comments on the threads in forums we started. Does that mean if we talk about Game #3 even earlier we’ll again double the hype? We’re going to try something bold with Game #3. Keep an eye out in the coming weeks, well pretty much as soon as we’ve decided Game #3 IS game #3. Fans of Loopycube and the general iOS community will be hit with a very early announcement! When would you share your game with the people in these categories? Are you like us and still struggling to find the right time to share the game with the world?